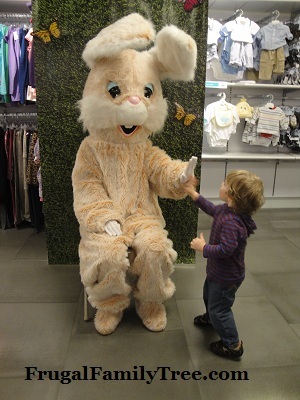 At our local mall the store Children's Place hosted a Garden Party where they served cookies, lemonade and invited the Easter Bunny. My son is so sweet he waited his turn in line, waved to the lady dress as a fairy, he was all smiles. Until it was his turn to sit on the Easter Bunny's lap. He put his head down, his little arms went to his side all stumped down, then his little bottom lip stuck out like he was gonna cry. He shook his head and told me "no". It was so sad. He normally likes characters like Chuck E Cheese and our local baseball team mascot. I told him it was fine if he didn't want to sit with the bunny so I asked him if he would like to give the bunny a high five. He smiled but would not do it until he first saw me give the bunny a high five. He smiled ran up to the Easter Bunny and gave him a big high five. He did not sit in the Easter Bunny's lap but he left with a smile on his face and that made me happy. Maybe next year he will be ok with it, maybe not just as long as he is happy I will be happy too. Plus it was Free Pretzel day at Aunt Annie's at the mall! We both got a pretzel and then played at the mall play center. It was a great day and free!